Circus Luminescence is a collaborative project using circus arts as a medium to shine. 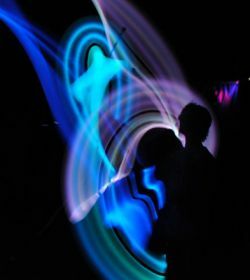 Founded by Eli March, this innovative troupe specializes in Glow, Black-light, Daytime and Fire Shows. An ultraviolet universe of infinite imagination, with award-winning juggling, theatre, flow arts, live music, high times and cartoon like “proppets,” the psychedelic stylings of Circus Luminescence is a treat for the eyes, ears, and soul.